The second Saturday in September brings hundreds of people to the White River in Hamilton County to help clean up decades of abuse. In 1995, a few friends came together in a stretch of river in downtown Noblesville to make a difference in their community. 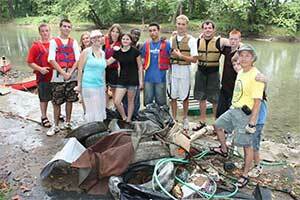 At the time, it was very difficult to canoe or fish anywhere on the river without running into some kind of trash. Tires, hot water heaters, cars and anything you can imagine had been dumped into the river. This group of guys just decided to start removing all the stuff they came across and unknowingly started a lasting legacy for our community; for over two decades this tradition has continued. In the first 20 years of the event, more than 400 tons — that’s more than 800,000 pounds of trash — have been removed from the Hamilton County stretch of the White River. Register today to help with the 2016 Cleanup, taking place Saturday, September 10 from 8 a.m. to noon. Thank you to all who helped with our 28th Annual Downtown White River Cleanup this past April 30! All targeted cleanup sites were on the river corridor within the city center. Your enthusiasm and hard work made the event a great success! Bryan Brown learned to love paddling on Indiana’s White River and that joy has become a life-long passion. 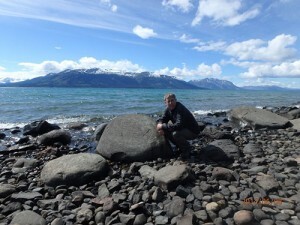 Now regarded as an eco-adventure traveler, Bryan will speak at Holliday Park at 1 p.m., Sunday, March 6. The event is hosted by Friends of the White River in partnership with Holliday Park and is free to the public. Bryan successfully completed the first-ever solo unsupported descent of the entire 2,400-mile Colorado River watershed in 2013. The Green River/Colorado River watershed features some of the most fabled and remote whitewater passages on earth — Dinosaur National Monument, Desolation Canyon, Cataract Canyon, Grand Canyon and Westwater Canyon. He also completed a solo 57-day, 2,300-mile source-to-mouth kayak expedition of the Yukon River from Lewellyn Glacier near Atlin, British Columbia to the Bering Sea. Bryan also made the longest self-supported descent of Canada’s MacKenzie River. His presentations often focus on strategic water-use issues. Bryan is a native Hoosier and an IU graduate.